Let’s start with some basics of the Internet. Data on the Internet travel in data chunks, called packets. Before packets are shipped they need to go through a kind of sorting facility, the Internet Service Provider (ISP). ISP are (generally) telecommunication companies like Verizon or Comcast. Net Neutrality is the principle that governments should mandate ISP to treat all data on the Internet the same, and not discriminate or charge differently by user, content, website, platform, application, type of attached equipment, or method of communication. Blocking: ISPs cannot discriminate against any lawful content by blocking websites or apps. Throttling: ISPs cannot slow the transmission of data based on the nature of the content, as long as it is legal. Paid prioritization: ISP cannot create an internet ‘fast lane’ for companies and consumers who pay premiums, and a slow lane for those who don’t. The FCC voted in December 2017 to repeal Obama-era net neutrality rules, so the Internet in the US is currently do not under net neutrality rules. There are many arguments pro and con net neutrality. Without any regulation, cable and telecommunications companies could have the control which websites load quickly, load slowly, or do not load at all, creating advantages for their own search engines, Internet phone services, and streaming video services – and slowing access or blocking access to those of competitors. User who gets used to the “fast lane” on the Internet would find the “slow lane” intolerable in comparison, greatly disadvantaging any provider who is unable to pay for the “fast lane”. A neutral net will foster free speech and lead to further democratic participation on the Internet. Without regulation ISP would control what is seen as well as how much it costs to see it. By ensuring that all people and websites have equal access to each other, regardless of their ability to pay, proponents of net neutrality wish to prevent the need to pay for speech and the further centralization of media power. Allowing cable companies the right to demand a toll to guarantee quality or premium delivery would create an exploitative business model based on the ISPs position as gatekeepers. Allowing for preferential treatment of Internet traffic, or tiered service, would put newer online companies at a disadvantage and slow innovation in online services. Without network neutrality, the Internet will undergo a transformation from a market ruled by innovation to one ruled by deal-making. It is a preservation of the way the Internet has always operated, where the quality of websites and services determined whether they succeeded or failed, rather than deals with ISPs. Eliminating net neutrality would lead to the Internet resembling the world of cable TV, so that access to and distribution of content would be managed by a handful of massive, near monopolistic companies, though there are multiple service providers in each region. Non-net neutrality will involve leveraging quality of service to extract remuneration from websites that want to avoid being slowed down. This theory was confirmed in 2014 when Netflix announced it was making payments to Comcast and Verizon to avoid throttling, slower internet speeds for particular services or websites, by those ISPs. These payments were described by Netflix founder Reed Hastings as “an arbitrary tax” and “arbitrary interconnection tolls”. Paid prioritization of bandwidth is necessary for future innovation on the Internet. Telecom providers should have the ability to provide preferential treatment in the form of tiered services, for example by giving online companies willing to pay the ability to transfer their data packets faster than other Internet traffic. The added income from such services could be used to pay for the building of increased broadband access to more consumers. Net neutrality would make it more difficult for ISPs and other network operators to recoup their investments in broadband networks. They would have no incentive to make large investments to develop advanced fibre-optic networks if they are prohibited from charging higher preferred access fees to companies that wish to take advantage of the expanded capabilities of such networks. If you have these pure net neutrality rules where you can never charge a company like Netflix anything, you’re not ever going to get a return on continued network investment — which means you’ll stop investing in the network. Besides, the Internet is already not a level playing field, that large companies achieve a performance advantage over smaller competitors by providing more and better-quality servers and buying high-bandwidth services. Another strong argument anti regulation is that the Internet has functioned quite well for the past 15 years without net neutrality. Government attempts to regulate technology have been extraordinarily counterproductive in the past. The Internet is not broken, and it got here without government regulation and probably in part because of lack of government regulation. But it’s not only customers who could be paying more, ISPs may charge companies a toll to make their content available. That’s one argument lobbed by net-neutrality supporters, that repealing the rules would kill innovation and favor the current behemoths. If every new company has to pay to play, that would be sucking dollars away from innovation and using them to line ISP pockets. And if smaller companies couldn’t afford these tolls, competition would thin, and we’d be left with less content to choose from. A lot of US states are in favor of net neutrality and are trying to reinstate it. Washington state and California recently signed its own net neutrality bill into law, with legislatures in many other states (among which Maryland, Connecticut and Montana) all debating their own bills. Governors of other states, including New York, and New Jersey have passed executive orders aimed at preserving net neutrality countering the FCC’s move. Courts offer another venue for those opposed to the FCC action. A range of tech companies have filed lawsuits seeking to reverse the commission’s repeal. Recently, a suit was filed by six companies, among them Etsy, Foursquare and Kickstarter. 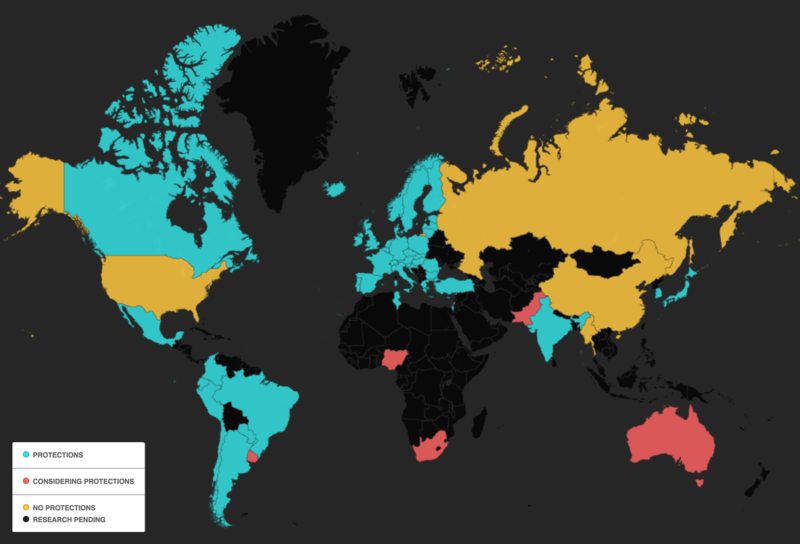 Net neutrality is debated not only in the US, but all over the world. Canadian laws are considered the strictest in the world. In 2016, the Telecom Regulatory Authority of India (TRAI) banned differential pricing of data services. EU Regulation sets the basic framework for ensuring net neutrality across the entire European Union. However, the regulation’s text has been criticized as offering loopholes that can undermine the regulation’s effectiveness. Some EU member states, such as Slovenia and the Netherlands, have stronger net neutrality laws. In Germany mobile device ISP’s like Deutsche Telekom and Vodafone are offering services that might be seen as undermining net neutrality. As part of the European Union, Portugal is bound to the laws protecting net neutrality established by the EU in 2002. However, the Portuguese government still allows for certain kinds of pricing models which are banned under most net neutrality rules. They allow for broadband providers to offer special pricing packages in which customers can pay for extra data that is only designated for the use of specific websites. For example, one package allows customers to pay extra for more data that can be used for social media websites such as Facebook and Twitter. Net neutrality laws passed in 2009 in Italy. The bill refuses all the discrimination: related by the content, the service and the device. The bill is generally about Internet (“a statute for the Internet”) and treat different topics like network neutrality, free software, giving an Internet access to everyone. In the UK, net neutrality is currently protected by EU policy. Potentially, after Brexit, the Government could choose to revoke this policy, although this is unlikely because it has already committed to a Universal Service Obligation (USO), effectively making broadband access a legal requirement.